If you’re anywhere near as wedding obsessed as myself, My dears, I’ve got something to admit. It’s no secret that we are head over heels for bridal fashion here at itakeyou, and I can’t wait to share the object of my affection with you all. The Cotswold Frock Shop Offering brides a fabulous selection of dresses. 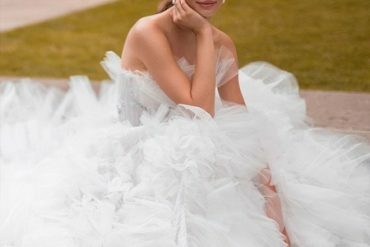 With over 500 wedding dresses from designers such as Lusan Mandongus, Mori Lee, Romantica , Eternity Bridal, Dessy, Da Vinci, Benjamin Roberts and much more… you’re bound to find the dress of your dreams! Because The Cotswold Frock Shop isn’t just any online bridal shop… it’s an amazing experience for all of you lovely UK bride. The Cotswold Frock Shop, give us a room full of beautiful wedding dresses, bridesmaids dresses, occasion wear, gorgeous fascination and seriously stunning accessories, the options are more breathtaking than ever before. I know, it’s hard to believe! Stunning, am I right?! Popular styles include Floor Length Dresses, Tea Length Dresses, Fitted Sleeves and A-line dresses. The mother of the bride at The Cotswold Frock Shop is a fashionable, modern woman, largely unconstrained by formality, style and colour. It’s not every day you get to go shopping for the most important item of clothing you’ll ever wear; and the experience should be incredible from start to finish!